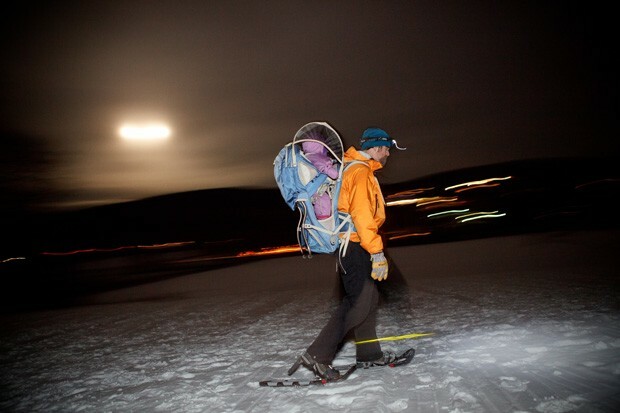 It's a Snowshoe-In | Fit Families | Kids VT - small people, big ideas! Snowshoeing is a favorite cold-weather workout for me and my husband, and we want our 1-year-old, Celia, to love it, too. The world's easiest winter sport requires minimal equipment and no experience, and offers a cozy perch for the baby. It gets the whole family out in the woods — the perfect antidote to winter boredom. We've ventured out quite a few times this year, despite less-than-ideal conditions, starting with a free Full Moon Hike hosted by the St. Albans Recreation Commission at Hard'ack. We joined a crowd of about 20 people for a mildly invigorating 2.5-mile woodsy nighttime trail hike. Celia was the youngest among the trekking group, which included families with kids, young adults and retirees. Because it was such a short trip, we didn't bring any special supplies — just a few snacks in case one of us got hungry. The event organizers marked the path with glow sticks, and the moon took it from there. It was so bright that we didn't even need our headlamps. Even scant snow cover was enough to give the outing winter-wonderland appeal. Extra traction from the snowshoe spikes got us through icier spots and up slippery hills. Celia was content to ride along, humming to herself the whole way. We used the same Kelty backpack we take on summer hikes but noted an unexpected perk: Having a young kid pressed against your back keeps you a little warmer. The hourlong guided walk began at 6 p.m., which perfectly accommodated our post-workday schedule. The best part: the warm fire, hot chocolate and s'mores at the end. Vermont is full of places to snowshoe — we've also visited the Nordic Ski & Snowshoe Adventure Center at Smugglers' Notch on several occasions. But you don't have to go far. Those short, local hikes you discovered last summer are a perfect start. Even simply grabbing your shoes for a quick trip around the block after a fresh snowfall is fun. The key is taking that first step. Show your baby how it's done. Before you know it, he or she will be following alongside. Renting is a good starter option. 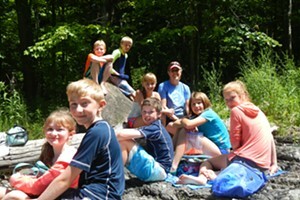 St. Albans Recreation offers free pairs for their hikes. Most Nordic centers, including the one at Smugglers' Notch, offer rentals and lessons. Purchasing a pair doesn't have to be costly. Buy used demo pairs from ski shops or Nordic centers at the end of the season when they're on sale.